← Do You Need Wisdom Teeth Removal? Composite fillings in Irvine consist of a customizable plastic material that is designed to match your teeth. Because composite materials contain absolutely no mercury, some experts feel it is a safer option than the old black amalgam fillings of the past. While most dentists believe amalgam fillings to be completely safe and appropriate treatment for dental decay, some dentists would rather not take that risk. Some patients complain of hot and cold sensitivity with amalgam fillings, as well. Because they are metal, they are better conductors than composites. Additionally, we preserve more of your tooth structure when placing a composite filling as opposed to an amalgam filling because less prep work is necessary. While composites generally take a little more time because of the curing process, your filling will be as hard as it will get when you leave our office. That means you can chew on it right away, unlike amalgam fillings that must cure for hours before chewing on them. 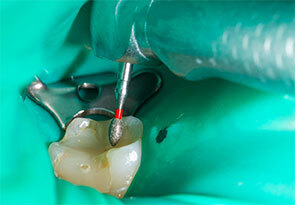 Composite fillings in Irvine are usually placed in one appointment. While the tooth is numb, your dentist will remove decay as necessary. The space will then be thoroughly cleaned and carefully prepared before the new filling is placed. If the decay was near the nerve of the tooth, a special medication will be applied for added protection. The composite filling will then be precisely placed, shaped, and polished, restoring your tooth to its original shape and function. While composites fillings tend to cost a little more, the benefits of using them are many. Aside from the obvious aesthetic advantages, composite materials and techniques constantly improve making them as long lasting and reliable as amalgams. We encourage you to contact us with any questions about Composite fillings in Irvine. Please call our office or schedule an appointment now. This entry was posted in Irvine Dentist and tagged composite filling irvine, composite fillings, dental fillings. Bookmark the permalink.